Van Gaal, 64, spent two seasons as a team-mate of 67-year-old Advocaat at Sparta Rotterdam between 1980 and 1982. 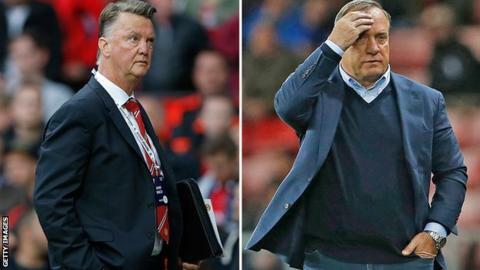 Advocaat had a better record in managerial meetings when he was at PSV and Van Gaal at Ajax, winning three and drawing five of their nine encounters. Meanwhile, striker James Wilson has signed a new four-year contract at United, with an option of a further year. The 19-year-old academy graduate scored two goals on his debut in a 3-1 victory against Hull City in May 2014, but has featured in just two league games under Van Gaal. Van Gaal said: "James is one of the brightest young English prospects and we are delighted he has signed a new contract." The Dutchman said on Friday he would wait until December before deciding whether he will send the Wilson out on loan to get further experience. Gossip: Guardiola lined up by England? Read more on Gossip: Guardiola lined up by England?